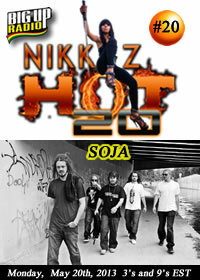 BigUpRadio.com proudly presents the Nikki Z Hot 20 weekly reggae dancehall show hosted by Diva Nikki Z. The show features weekly special guests for exclusive interviews as well as a countdown of the hottest 20 tracks in the Caribbean. The amazing roots reggae band SOJA aka Soldiers of Jah Army make a guest appearance this week. Don't miss this an exclusive interview with SOJA. Don't miss this show on Monday, May 20th. Showtimes are 3am, 9am, 3pm and 9pm EST.